After last night’s quirky yet mightily delicious Rioja, I’ve got the distinct feeling that this weekend run of three wines is going to deliver fireworks. Lo and behold, today’s reveal is a Chablis from one of the best known, most emblematic producers in the region. Burgundy remains my favourite wine region despite many strong contenders. And Chablis, that northern Burgundian outpost of stark minerality and abject crystalline purity, is a particularly singular wine region unto itself. Plagued by viticultural hazards, including regular springtime frosts and the odd unpredictable hailstorm, grape growing is no easy task in this hinterland. I continue to marvel at exactly how these hard-working vintners can distill these harsh conditions into such sheer, stony, precise, pixelated and elegant wines. They are known for a distinctive “gunflint” note, described as “goût de pierre à fusil“, or “steely” if you prefer something rather less martial. ‘Minerality” remains hard to definitively pin down as a construct. We have to date identified no specific “mineral” receptors in the human gustatory system, and yet one cannot reasonably deny the existence of such aromas in certain wines. I’ve even heard the argument that Chablis is where Chardonnay shines most brightly, its true spiritual home. The notion that this grape’s genuine essence could be more ethereal mineral than gaudy fruit intrigues me to no end, subjective viewpoint though it may be. William Fevre began with the 1959 harvest, although William’s father Maurice was growing grapes back in the 1930s, mainly in Chablis’ Grand Cru vineyards. Today William Fevre owns the largest number of Grand and Premier Cru vineyards in the region, populated mostly by old, low-yielding vines. The estate was purchased by the Henriot family of Champagne in 1998. Although such a takeover can sometimes be a harbinger of decreased quality, the Henriots instead implemented a new philosophy geared towards better preservation of the nuances of Chablis terroir: use of new oak was abolished in favour of old barrels with an average age of 6 years. Grapes are grown organically, although the estate isn’t particularly fussy about getting official certification. William Fevre seeks to preserve even the most muted variations across individual sites. This focus is coupled with an emphasis on “instant appeal” in the wines, one of those ideological melds of tradition and avant-garde technology that works, and works well. The 2015 vintage in Chablis was characterized by a late onset of winter, with some frost and rain until the end of May followed by hot, dry weather at the start of June until the end of August. This is pretty optimal for the Petit Chablis and (non-Cru) Chablis vineyards, lesser sites where grapes can struggle to reach an appropriate degree of ripeness. Indeed, the fine folks at Bricks chose well here. According to William Fevre cellarmaster Didier Seguier, “It’s a perfect vintage for the lower appellations, Petit Chablis and Chablis… These can be difficult in cool, late years, but in ’15 they have a good level of ripeness and freshness.” The entry level Chablis AOC profiled here is harvested manually, with the grapes receiving a brief, gentle pneumatic press followed by gravity settling of the juice. Some fine lees is retained, and the wine does undergo malolactic fermentation (many basic Chablis do not, although I believe the practice has become more common in the region of late). Maturation occurs only in stainless steel. This all sounds textbook. Frankly, that’s exactly what I am expecting here, in the very best way. I am not disappointed. The fruits include tart Granny Smith apple and the most stern and austere of the green pears, followed by some suggestions of under-ripe hard nectarine, lemon and watermelon rinds (you know, that watery white stuff), a few ghosts of pineapple and starfruit. White berries do occur in nature (e.g. the snowberry) but they are largely unpalatable. If one were indeed edible, I feel I would detect such a note in this taut, precise little dynamo. A pleasing minerality of matchlock musket, chalkboards, and Epsom salts begins to billow from the glass, and I welcome more associations of green banana peel, salted cultured butter, margarita glass rim, and Siberian peashrub/caragana flowers (let’s go with “acacia” for those of you following along on a tasting wheel). The fresh acid is far from meek, malo notwithstanding, and the finish recalls an abrupt sharp slap followed by a few conciliatory caresses. This aggression will not stand, man. Truth be told, this is far too classy to merit more than a few allusions to anything truly bellicose. OK, time to bring this long and winding road of a tasting review to a close. I had set this up so that we’d end on a high note with the most prestigious bottles in the tasting, the illustrious Grand Crus, but for reasons outside their control, the drinking experience ended up being somewhat anticlimactic. And no, it wasn’t because we were 10 bottles in by this point. That’s what made the next morning anticlimactic. A.k.a. over $300 worth of wine that really shouldn't be open yet. 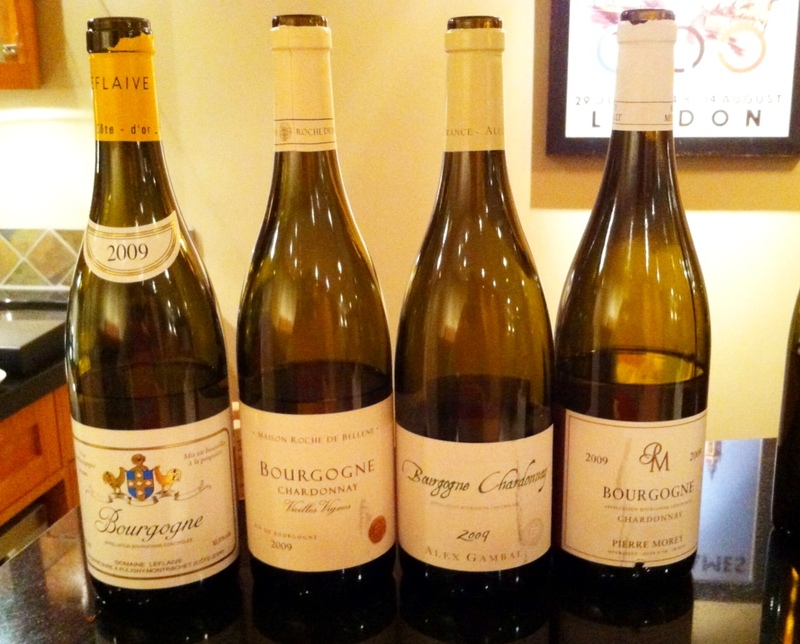 If you missed the inaugural entry about my dozen-bottle, Bourgogne-Blanc-to-Grand Cru, no-holds-barred white Burgundy tasting, check out my write up of four 2009 Bourgogne Blancs of varying levels of quality and corked-ness here. Tonight we’re jumping right into Flight #2. Slightly out of order: from left to right, Wines 1, 3, 2. 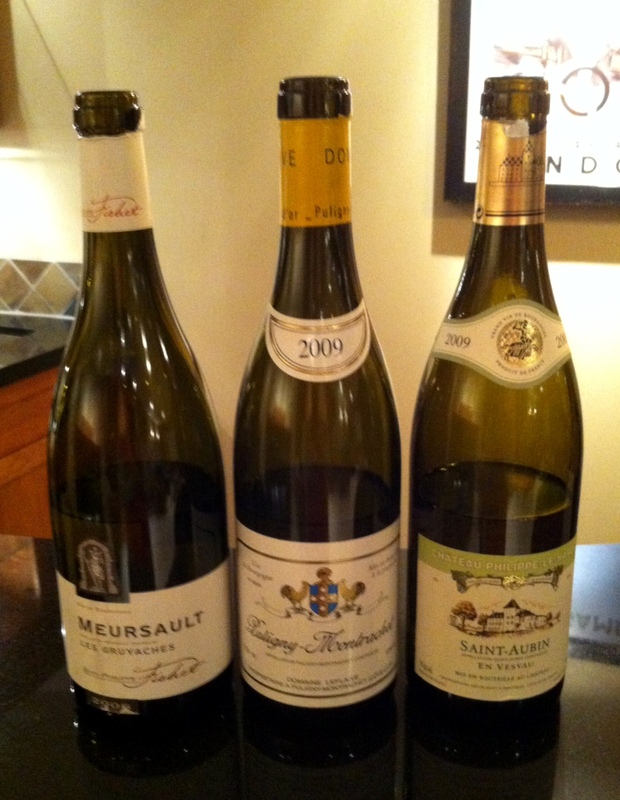 It begins: the first 4 of a dozen hopefully-representative white Burgundies. I acknowledge that it’s definitely been awhile. I spent my evenings last week cleaning out my basement, then took the Easter weekend off, then faced a total loss of home Internet for a few days, all of which added up to a blog-less streak of epic proportions…sorry about that. 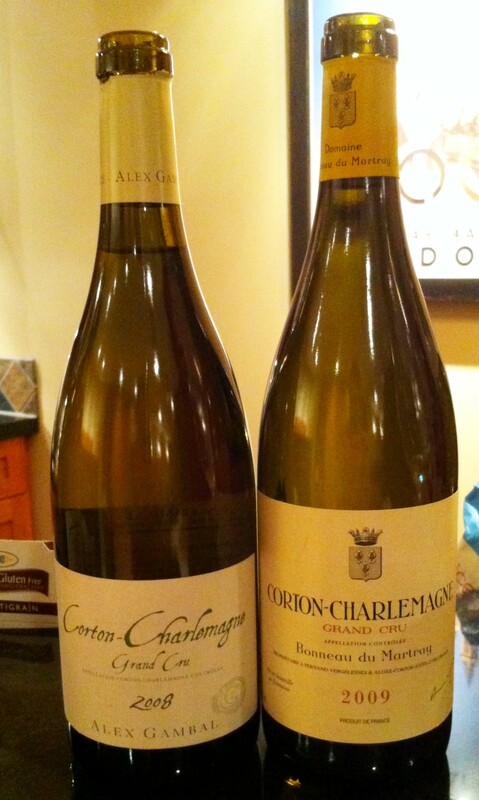 To make it up to you, instead of posting a lonely wine review tonight, I’m diving back into action with the first instalment of a multi-part writeup showcasing the results of the long-planned white Burgundy tasting that I’ve had in the works since January and that fulfills a 2012 New Year’s Resolution of mine. More on the planning behind the tasting and the rationale for the various wines selected here. To summarize for those of you who don’t feel like clicking on the link above, the goal of the tasting was to open bottles from the four main Burgundy quality classifications (Bourgogne Blanc, village level, Premier Cru, Grand Cru), spanning some of the key sub-regions for Burgundian whites (Puligny-Montrachet, Chassagne-Montrachet, Meursault, Corton-Charlemagne), to see how the wines from each of the sub-areas differed from those from others and how the wines from the same sub-areas varied from producer to producer and between quality levels. I will vouch from experience that delving to the bottom of these analytical quandaries required a lot of drinking. Such is life. 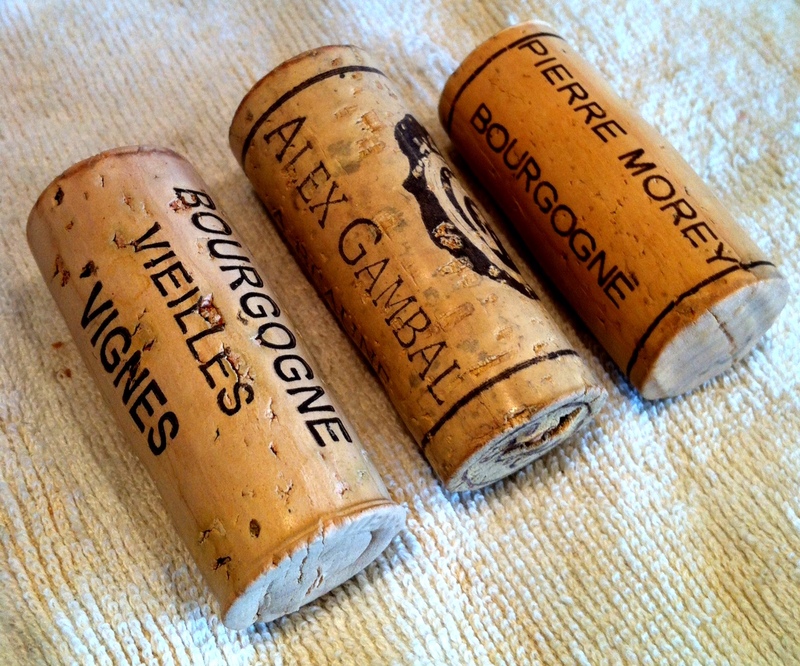 Cork Ratings for wines 1-3: 2.5/10, 6.5/10, 5/10. Meh.